Fine china is as fragile as it is beautiful. If you own fine china, you probably only take it out of storage occasionally for special occasions. You’re very careful with your china while you’re using it, but are you as careful when you’re not? 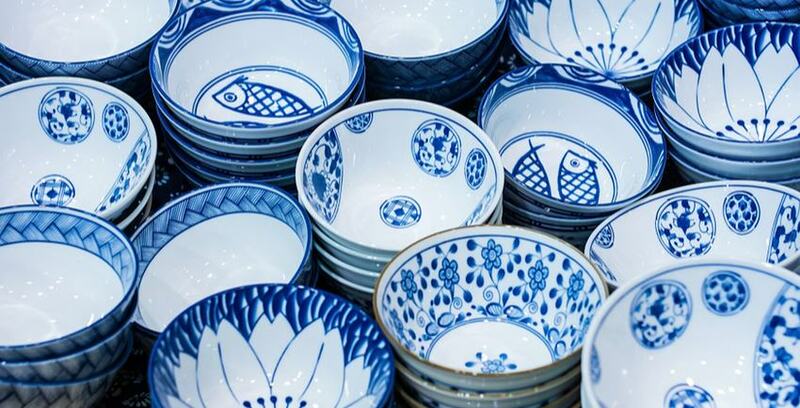 Are you storing your china properly? If you're not 100% sure, it's time to read our tips below. We've put together a guide to properly storing your fine china. Follow these rules to keep your china safe, so it can continue to be a treasured family heirloom. Everything needs to be wrapped, but not in a newspaper. We get it: a newspaper is cheap and easily available. Unfortunately, it can leave behind a residue that can cling to or stain the dishes. Ordering a roll of packing paper is just as easy (and cheap) and saves you some headache. When we say everything needs to be wrapped, we mean everything. Anything with a lid needs to be separated into individual parts and wrapped accordingly. Once you’ve wrapped the china in paper, wrap it with a second layer of bubble wrap to help guarantee its safety. China is notoriously fragile, so the more protected it is, the better. Turn plates and bowls on their sides. This is the safest way to store these pieces for a number of reasons. The edges of china plates and bowls dry harder than the rest, making them tougher and less fragile. Storing china plates on their sides helps protect them from breaking. Use dividers inside your box. If your china set includes glassware like mugs, cups, or goblets, you should use cardboard dividers to separate them. This added structure keeps them from jostling around in the box, chipping and cracking in the process. Store them in plastic bins, preferably small ones. Plastic containers are the ideal storage bin for fine china for a number of reasons. They're airtight, sturdier, and smaller than cardboard boxes. Fine china can become heavy when packed away, so it's best to store china in smaller containers. That way, they're easier to handle and transport. The last thing you want to do is drop your china! Consider storing them in a controlled environment. Storing precious items in your basement or attic poses certain risks. If you store your china in a busy area of your home, you can’t guarantee someone won’t accidentally damage it. If it’s up in the attic, that means you have to worry about carrying the bins up and down stairs. You can avoid these risks for your precious items by storing them inside a climate-controlled storage unit. If you put your china in a storage unit, you’ll always know that it’s safe and stored properly. Speaking of storage units, Storage Direct offers units for any and all considerations. If you need a place for your china, you can’t do better than a Storage Direct unit. We’ll keep your prized possessions safe.